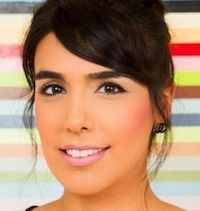 I've found a woman who perfectly embodies the future of work: Falon Fatemi. She is female, young, a minority, and the CEO of an exciting new startup. With millions dollars in support from Mark Cuban, Ventures, Canaan Partners, and NEA (among others), this 30-year old, once Google's youngest employee, is the founder of a fast-rising startup called Node.io. She is an emerging major player in the future of the web that Seth Godin discussed in 2007 - a web that is cognitive. This means that it understands who we are, what we care about, and proactively offers us personalized recommendations, no search required. I wanted to know how Falon's professional experience has been affected by the fact that she is a young, minority woman and how her experience differed from that of a young, white male in a similar professional trajectory. So I asked. First, I asked Falon to identify what she considers to be the advantages and disadvantages of being a woman in her career path. She noted that being a woman is advantageous because it helps you stand out from the crowd, and if you are well versed and prepared, you can easily exceed expectations. Falon also believes that women think and work differently, in a way that results in more creative and collaborative approaches, which based on data, leads to more successful businesses. One disadvantage she notices is that she is often seen as a woman first, and for her accomplishments second. Consequently, she thinks women have to work harder. Falon also notes that as a woman, you have to deal with inappropriate behavior from men due to a lack of social education, as well as men reacting unfavorably because they made advances you rejected. This happens even more in the "boys club" where alcohol blurs professional and personal lines. That is if you ever get to participate in the "boys club". She said, "We can't partake in the "boy's club." I would define the boy's club as the male form of bonding and building their network. This might involve drinking, golfing, mountain biking trips, ski trips, going out, smoking cigars, and doing deals with other men." Not being able to participate in these bonding and networking experiences is a disadvantage for many reasons. One of them is forming relationships with mentors and sponsors, another problem women encounter when trying to advance their careers. At Google, I worked with the most incredible women like Stacy Philpot Brown, Kim Jabal, Sheryl Sandberg, Megan Smith, and Kelly Liang. Megan Smith was instrumental in helping me discover my love and talent for business development. The first four people who gave me a check for my company and literally said, "We're investing in you" included Lee Linden, Tim Fong, Jason Putorti, and Alex Moore. My first lead investor, Jon Sakoda from NEA who has been there from day 1. My advisors like Jager McConnell, Debbie Landa, Sachin Rehki who I learn so much from every day. And finally, my husband who is the best partner I could ask for. I believe having this many mentors was fundamental to Falon's success. If men already hold the majority of executive positions, and only mentor or sponsor other men, how can women reach their full potential in that setting? Not getting the invitation to the "boy's club" is a symptom of women not being taken seriously at work. Being met with an initial level of skepticism in meetings that my male colleagues aren't subject to is definitely a challenge. To combat this I simply work harder. I become a domain expert if that's what it takes. For example, I run a very technical, challenging startup and in order to hire talented engineers I not only have to be able to speak to the details of our architecture, infrastructure, pipeline, artificial intelligence, machines learning, and natural language processing, but I have to stay up to date with all the innovations with these technologies as well. Going to undergrad full-time and working at Google full-time at the same time (at 19 years old). I was incredibly blessed to have the opportunity to start working at Google in 2005 and apply all my learnings in undergrad classes to real world applications and projects. Also leaving Google in 2011 for the startup world was the best decision I ever made and has led me to where I am today. Can you imagine leaving a job at Google as a young woman being the best decision you ever made? It was for Falon, and that is because she was confident enough to take that risk. I was curious what other aspects of her personality helped her be successful. She said, "Believing nothing is impossible. Being resilient no matter what challenge I face. Asking why. And being empathetic." I was especially happy to hear Falon mention empathy, a quality that is key to strong leadership, yet often devalued. There needs to be more investment in social education. Much of the inappropriate behavior results from a lack of understanding in social norms and that's because Silicon Valley has traditionally been a male dominated industry. I found her perspective valuable. Seeing the problem as an area that can be helped with education was encouraging. My guess is there's a startup already underway for that. And just maybe, the founder is a woman.